It might be the next stage for your HR department. A new chapter that takes HR on an exciting journey of exploration into uncharted territory of business transformation. A new way of working that fosters creativity and connects more people than ever before. A new HR mindset that adds more value than ever before. What is does bimodal mean? 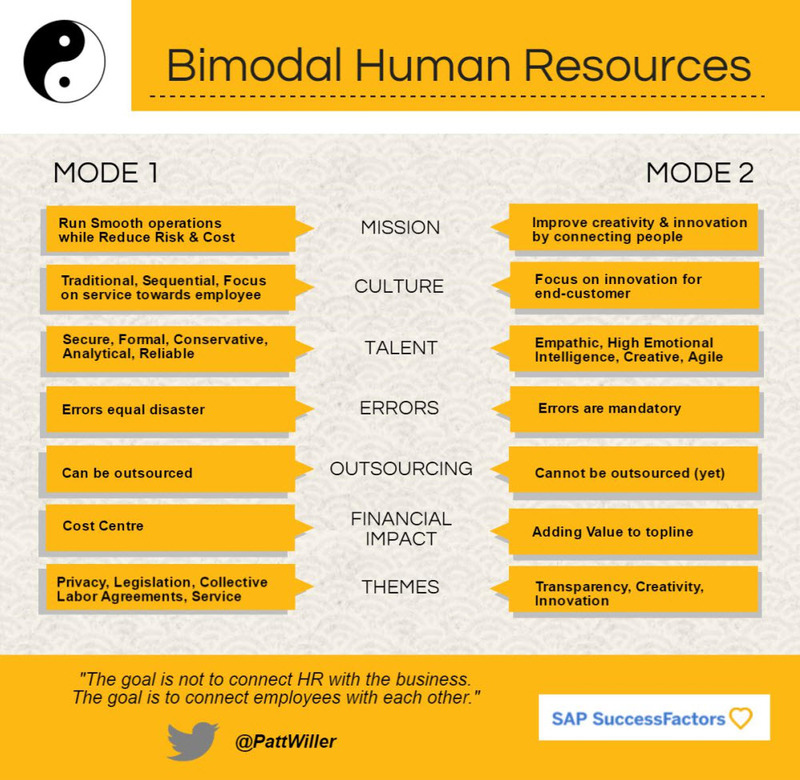 Bimodal is the practice of managing two separate but coherent styles of work. I heard the term first from Gartner. Their Bimodal IT model has CIO’s over the world rethinking their service to their organization. What are CHRO’s doing in the meantime? Is see great opportunity for Bi-Modal HR. Every company has transformation challenges. Transformation is change and changing something is more difficult than building something new. And the most difficult thing to change is culture. Taking on that change management with a bimodal attitude separates the explorers/innovators from the traditionalists, generating air for innovation. Innovation never comes from the center of the organization. It might be discussed in the boardroom, but it is rarely born there. The best ideas come to light at the edge of the organization. The area where people are connecting with people who think differently. It is the same fruitful environment where acquisitions happen. Many large organizations have ceased to truly innovate themselves. They morphed into acquisition artists that buy creativity to extend their kingdom and satisfy shareholders. Key creative people from such an acquisition often leave to stay creative. Their new initiatives are new targets for multinationals. Building a bimodal organization is like building a start-up within the company. A different, separate entity with employees that have a different attitude. Not better, but different! Mode 1 has focus on running smooth operations and reducing risk and cost. 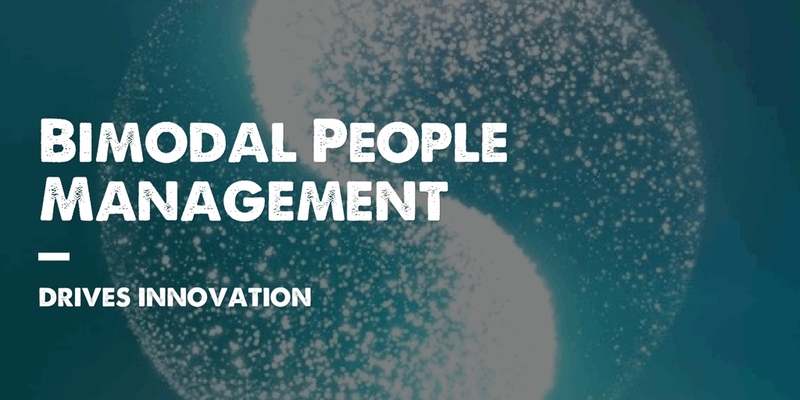 Mode 2 has focus on improving creativity and innovation by connecting people. HR Mode 1 is as complex as the companies (collective) labor agreements. Automation, cost reduction and improving service levels are key themes. That is also the reason why standardization and cloud solutions are such a fresh breeze. It’s the standardization that forces organizations to simplicity. The mindset is traditional and operational. People are concerned about safety, privacy and accuracy. The specialists that work are goal keepers. Errors are not welcome. The customer of HR mode 1 is the employee, who constantly demands clarity, stability en efficiency. Wat lies ahead for HR mode 1? The HR-to-Employee ratio has been in decline for years. Dave Ulrich’s model, shared service centers, self-service and technology are opportunities to continuously automate services and drive down cost. This trend will not stop. Self Service becomes Intelligent Services. Helpdesks become Chatbots. Classroom training became e-learning and breaks further down in gamified learning snippets generated by Artificial Intelligence. Looking far ahead I see Mode 1 HR ultimately being reduced close to very small teams. This is often referred to as: the future of HR is no HR. This mode is all about driving transformation. There are two things HR can do to drive transformation. Connect and Engage People in order to generate idea’s and help to execute them. The mindset is creative, fast and innovative. Empathy, Emotional Intelligence and the ability to connect people are crucial skills. Adding value, connecting people, creating self-guiding teams and transparency are key themes. HR mode 2 will be much more dispersed and integrated in the business. Business Partners on steroids who welcome errors in an effort to create optimal employee experiences. The customer of HR mode 2 is not the employee. It’s the end-customer who constantly demands better services and products. HR mode 2 is the catalyst for that. What lies ahead for mode 2? It’s a continuous non-linear exploration for the HR mode 2 team in a fast changing world with exponential dynamics. Workforce Analytics are only getting started. According to Moore’s law big data (to analyse) will only increase. This has a huge impact on our predictive capabilities. There will be more trends, such as AI, Machine Learning, Robotics, VR, Gamification and last but not least Social Collaboration. The HR mode 2 organization is the catalyst to connect the most valuable asset in every company: the human brains. Something that is close to impossible to outsource. Automating HR Mode 1 is a challenge, but not the challenge. HR has been doing HR mode 1 for ages, known as HR operations. Automation came in waves, driven by cost reduction. A split (between Mode 1 and 2) is also not the challenge. Many organizations already have different teams for HR operations and more strategic and tactic HR tasks, the latter often executed by HR business partners and change agents. Ulrichs book “Human Resources Champions” was released in 1997. That’s almost 20 years ago! Companies such as Google, Uber, Airbnb, Twitter, Snapchat, Netflix, Fitbit, Spotify, Dropbox, WhatsApp, SuccessFactors and Tesla didn’t exist. Neither did tools such as an iPhone, YouTube, Bitcoin, VR, Chatbots and self-driving cars. The real challenge is this: Innovation went from something nice-to-have to a necessity for survival in tomorrow’s marketplace. And that shift is changing HR too. The goal is not to connect HR with the business. The goal is to connect employees with each other. Working with a bimodal structure might just do the trick, because it shapes a mindset. It takes a different way of thinking that consequently results in different people, different management and a different culture for both modes of HR. As opposed to one department with very similar people and different roles. I’m not preaching a Trump wall between different HR teams. No, absolutely not! It’s about a conscious decision for different DNA in different teams to achieve different goals. Transparency about such an approach can help to respect and understand each other. To disrupt or to be disrupted. If you take a few steps back, the modes you have identified are two opposing strategies for creating shareholder value. Rather than defining them as conflicting (with a diagram depicting a pair of vectors creating a shearing force), maybe it would help to identify how the two benefit from and feed each other (with a diagram depicting a larger circle, enso, yin-yang…) creating a positive feedback loop? Jeremy, thanks for the feedback. Actually…. the yin-yang is there. look at the infographic title and the picture in the header. It’s just my lack of graphical designer skills to make this better. I totally agree with the yin-yang approach.